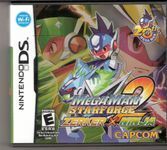 Mega Man Star Force 2 is an action RPG much in the same vein as the first game. It is rendered in an isometric style (sprites, views, etc.) during field gameplay, but its battle system is three-dimensional, with the battles being viewed from behind Mega Man, and movement restricted to only left and right. Since enemies have a much larger playing field, battle evasion seems limited, but the player is given a choice of techniques like shielding and homing attacks to keep battles balanced. Mega Man's life is a simple "Hit point" (HP) numerical system. When he takes damage, the number lowers, and when it reaches "zero," the game is over and the player must restart from their last save point. HP can be recovered in a number of ways, both in and out of battle.The player can also use their standard Mega Buster at any time to combat with, and upgrade items for Omega-Xis can be collected throughout the game to increase the Mega Buster's rate, power, and charge speed. The Mega Buster is constantly charging to release a single powerful shot, but the player can hold the button down to fire rapidly. Source: Wikipedia, "Mega Man Star Force 2", available under the CC-BY-SA License.